Welcome to festival (in your own home)! Follow the live broadcast of the “WE LOVE RADIO!” festival from Arts Centre BUDA in Kortrijk, Belgium, with artists well known for MDT audience: Mette Edvardsen, Nadja Hjorton, María Jerez, Alma Söderberg & Hendrik Willekens and some new names too: Antonia Baehr & Valèrie Castan, Manah Depauw & Quentin Manfroy, Myriam Van Imschoot, Peter Lenaerts, Arantxa Martínez & Nilo Gallego, Dianne Weller & Julie Pfleiderer. 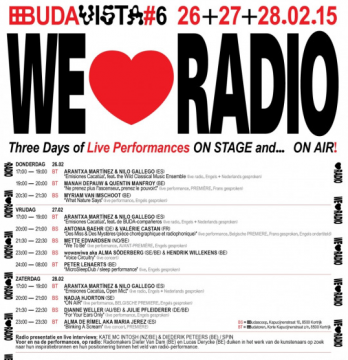 MDT collaborates with BUDA around the festival by offering our audience the opportunity to listen to the full program live via this link. The festival is curated by Agnes Quackels, BUDA. The full performance program can be seen and listened to live at the theater venues in BUDA, Kortrijk, or listened to wherever you wish, alone or together with friends and family. Follow the links in the radio program below for more info on the performances. In between the broadcasted performances Kate McIntosh and Diederik Peeters (SPIN) will discuss and interview the artists. Lucas Derycke & Dieter Van Dam has also composed an audio file/program based on the different artists and their inspiration sources.